BLOOMINGTON, Ind. -- On Friday (Oct. 29), WTIU-TV airs "Education Issues for Indiana 2010" a timely discussion of the most pressing issues facing students, parents and educators in Indiana. The hour-long broadcast premieres Friday at 9:30 p.m. on WTIU, the Public Broadcasting Service affiliate in Bloomington. 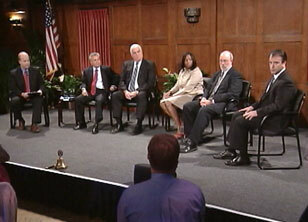 The Indiana University School of Education organized the panel discussion recorded before a live audience of the Bloomington Rotary Club at the Indiana Memorial Union's Alumni Hall on the IU Bloomington campus. The program features the perspectives of a teacher, administrator, business leader, education policy researcher and dean of the state's largest school of education and touches on a variety of topics especially pertinent to Hoosiers. Panelists discuss the upcoming school budget referenda throughout the state, the school budget situation, evaluation of student performance and teachers, and proposed state action on education matters. "With so much concern about the state of our schools in these particularly challenging times, we at the IU School of Education feel a responsibility to help increase public understanding of the issues as much as possible," said Gerardo Gonzalez, dean of the IU School of Education. "We think viewers will gain valuable perspective on these complex topics from our panelists' varied experiences and viewpoints." Joining Gonzalez as panelists for the program are: Terry Thompson, Superintendent for the Metropolitan School District of Wayne Township and named the 2010 Indiana Superintendent of the Year by the Indiana Association of Public School Superintendents; Terry Spradlin, associate director of the Center for Evaluation and Education Policy, who has conducted extensive research on Indiana school financing and other policy issues; John Burnett, president of the Columbus-based Community Education Coalition, which sponsors "Economic Opportunities through Education by 2015," or EcO15 -- an initiative of business, education and community leaders to advance K-12 education in a 10-county area in southeastern Indiana; and Taji Gibson, English and Ethnic Literature teacher at Bloomington High School North, recently chosen by the Indiana Department of Education to serve as a member of the Indiana Education Reform Cabinet. Chuck Carney, director of communications and media relations at the IU School of Education, will moderate the discussion. The program has been made available to other Indiana public broadcasting stations, which may also air it. A streaming version of the program will be available at www.education.indiana.edu after the broadcast.